This week, I have been working on some more Deathwatch Veterans armed with Bolters and my Deathwatch Rhino. The Rhino was really easy to paint up, I actually managed to get it all done in one day. 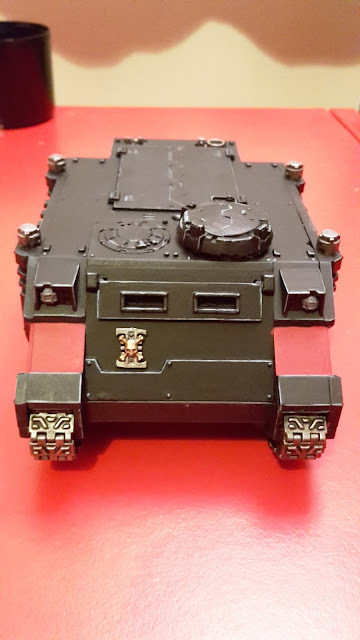 Doing edge highlighting on a vehicle with lots of straight lines and edges is pretty easy to do, so there was only the sections I decided to paint red and the metal work to finish off once all the highlighting was done. 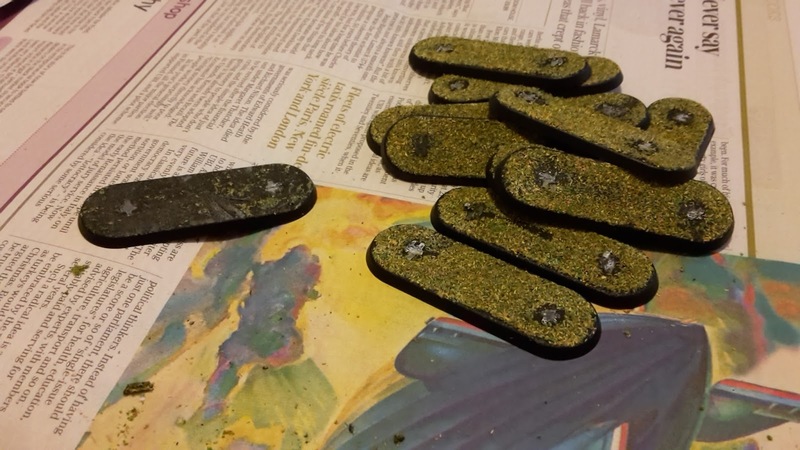 With 2016 drawing to a close, I thought that I would take a look at what has occurred in the last year, both in terms of my gaming/hobbying and for the blog itself. This has been quite a productive year for me in terms of my different armies for 40k. I have managed to get games in with most of my armies over the course of the year, with only my Vampire Counts suffering from a lack of games. My White Scars army certainly got the lions share of the gaming this year. They are really my tournament army, so I need a lot of practice with them for the various events that I attended this year. 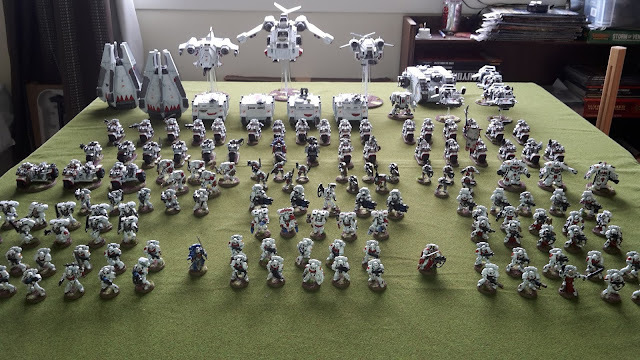 Back in August I actually completed all the models that I had for my White Scars, with almost 5000 points of Marines completed. I also re-based the entire army from a plain green base to a nicer brown base with static grass attached. I often get some nice compliments on the army whenever I go to different tournaments, which is always great to hear. They have performed pretty well for me over the last year and I will continue to use them and evolve the force. Right now, I have several Bike-mounted Librarians to paint up to add a Librarius Conclave to my force. This year, I have also started two new armies- the Deathwatch and Genestealers Cult. 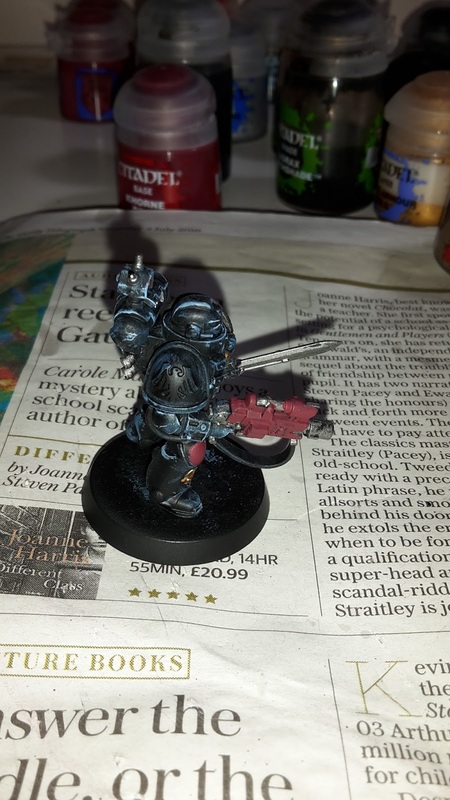 Regular readers will have seen the progress that I have been making on the Deathwatch, both in the painting aspect and the gaming aspects. I am really enjoying the army and hope to continue with it in the new year. The Genestealers Cult have not appeared on the pages of the blog yet. I have a ton of models bought and ready for assembly. At the moment, my focus has been on the Deathwatch, but the purple-skinned menace will be featured heavily on the blog next year, so keep an eye out for some interesting battle reports and hobby Sundays. This week's battle report sees my White Scars take on Tony's Orks. When I arranged to play Tony, I was originally going to take my Guard for a classic Ork/Guard match up. However, I discovered that I don't have my Codex with me in Newcastle, it must be packed away in a box back in Glasgow! I took my White Scars instead, but opted to go for a different, milder army than I would normally take to make for a better match up. I went for a mixed combat and shooting force. The Bikes, Vanguard Veterans and Assault Marines would provide some nice counter assault units as the Tactical Marines and Devastators fired at the Ork hordes. We completely forgot to roll for warlord traits, so neither side had one in the game. 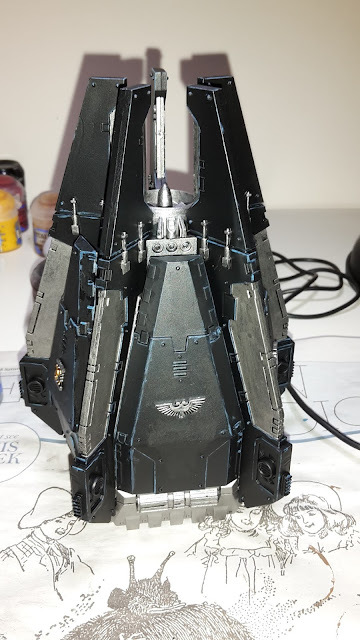 This week, I have been working on my Deathwatch Drop Pod and assembling some more Deathwatch Veterans. 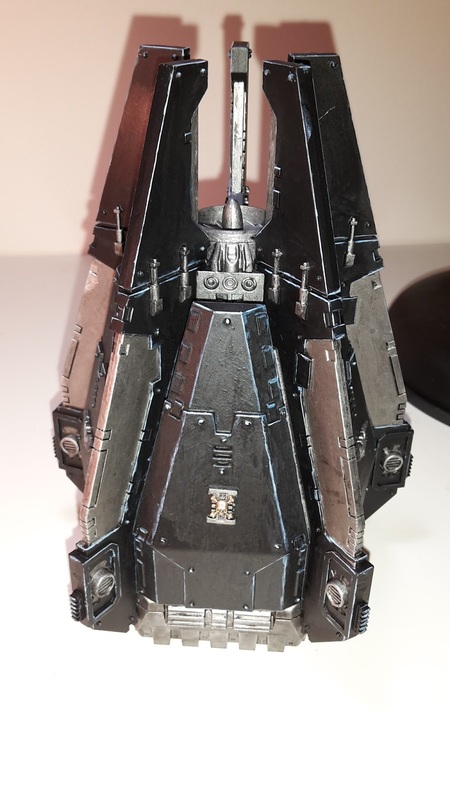 For the Drop Pod, I decided to go for a simple colour scheme, mostly just black and metal like the one pictured in the codex. I had a couple of problems with the painting of the drop pod. Firstly, the Thunderhawk Blue I used for the first highlight was a little thick. Watering it down helped a little, but I found it tough to get it to transfer from the brush to the Pod. Secondly, the Abaddon Black I used to touch up any mistakes I made with the highlighting or metal was a slightly different shade to the undercoat that I used on the model. As a result, the black was a bit patchy where I had made mistakes. This was helped a little by giving the model a wash with some Nuln Oil, but you can still see it if you look closely. A Merry Christmas from St Andrews Wargaming! 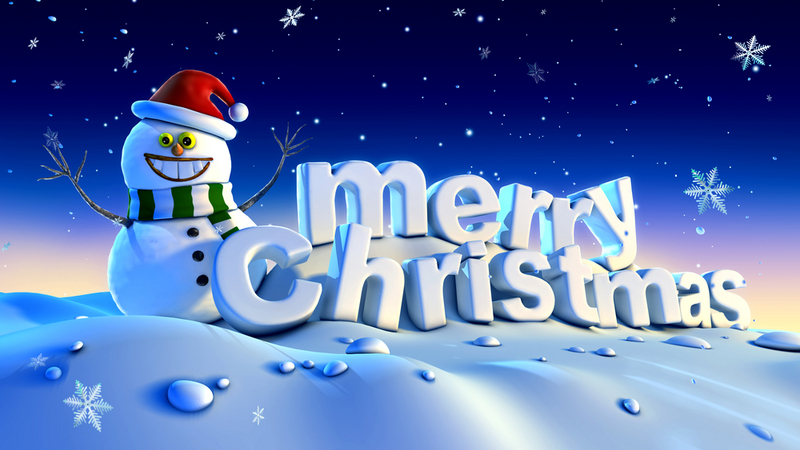 I hope that Santa was good to all of you, bringing you lots of 40k goodies. Did you get any good gaming gifts this year? If so, comment below and let the rest of us know what to be envious of. Hobby Sunday comes a day early this week, as I assume most people will be too busy tomorrow to be reading blog posts! This week, I have been finishing up the Deathwatch Bikers. For the first time, I painted the Riders and Bikers separately. I figured this would make it easier to get the details painted up individually. This did indeed make things much easier to get painted. 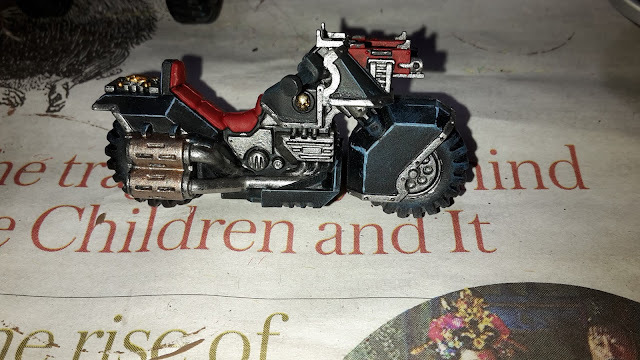 The edge highlighting was much easier on the bikes with all the straight edges on the model. Image courtesy of Confessions of a 40k Addict. Today, the blog hit just over 300,000 views. A big thanks to all the Russian bots who made this possible, they have been particularly busy over the last month to give me the big push before Christmas! In all seriousness though, thanks to everyone who reads and enjoys the blog (or reads and hates it!). I only hit 200,000 views back in August, so to get another one hundred thousand in little under 5 months is fantastic. 2016 has been a great year for my hobbying and the blog and I will soon be doing a recap of the year and what I hope to achieve in 2017 going forward. Any suggestions on what content you would like to see or how to improve the blog, let me know below. 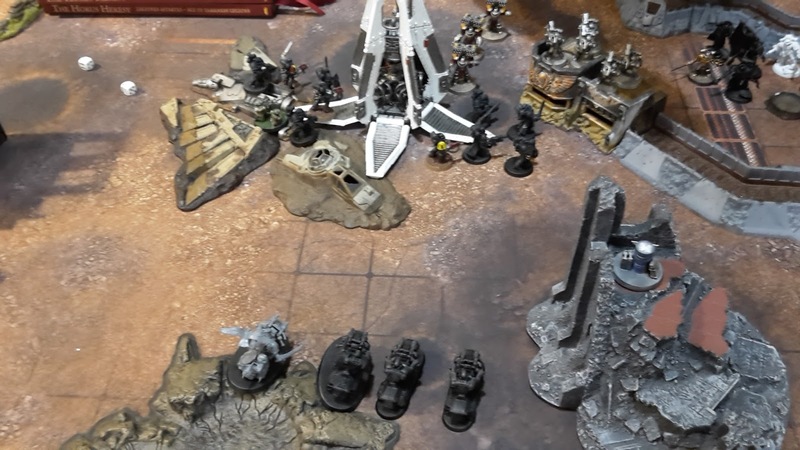 This week's battle report saw my Deathwatch take on a Necron Decurion, commanded by Tom, in the Contact Lost Maelstrom mission (3 cards per turn). My warlord trait was Bane of Monstrosities, giving me re-rolls to wound and AP against Monstrous Creatures, Tanks and Superheavy Vehicles for the Watch Master. The Librarian rolled on Fulmination, getting Electrosurge, Magnetokinesis and Electropulse. This time, I split my forces between the Blackspear Strike Force and the CAD. I decided to try the Librarian with the Stalker Boltgun Veterans. The Stalkers and Bikes would deploy first, with the rest of the army coming in via deep strike as the game went on. 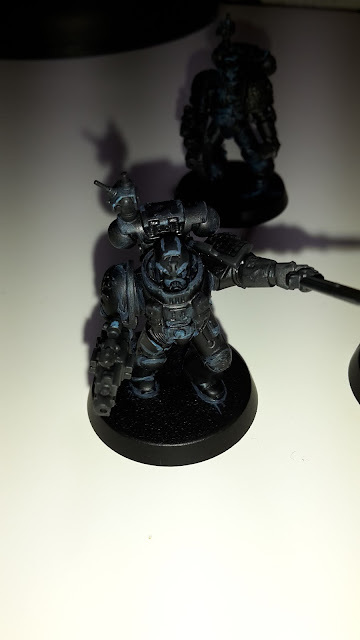 This week, I have been continuing my work on the Deathwatch Marines. I have completed another squad of Marines, this time armed with an Infernus Heavy Bolter and the Sergeant with a Xenophase Blade. 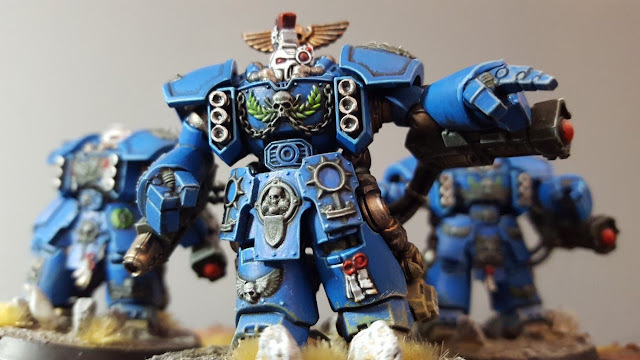 Today's editorial takes a look at some of the changes I have recently made to my hobby and gaming routine, and how it has given me a different outlook on 40k and how I play. 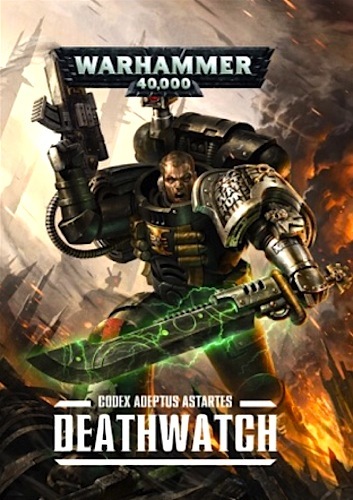 A few months ago, I purchased the Deathwatch codex on the day of its release. I had planned to review the Codex for the blog and then re-sell it on ebay. 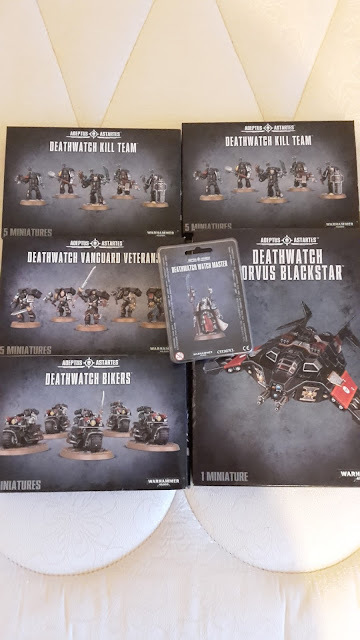 However, after reading the codex and writing my reviews of the Deathwatch, I started the enjoy the feel of the army and decided to start my own force. Now, I already have two Marine armies (the Dark Angels and White Scars, for those of you keeping score at home), but these are both primarily Bike-centric forces that use speed and mobility to achieve their goals in a game. I also have two horde armies, with my Astra Militarum and Ork forces, using massed firepower or combat attacks to defeat the enemy. 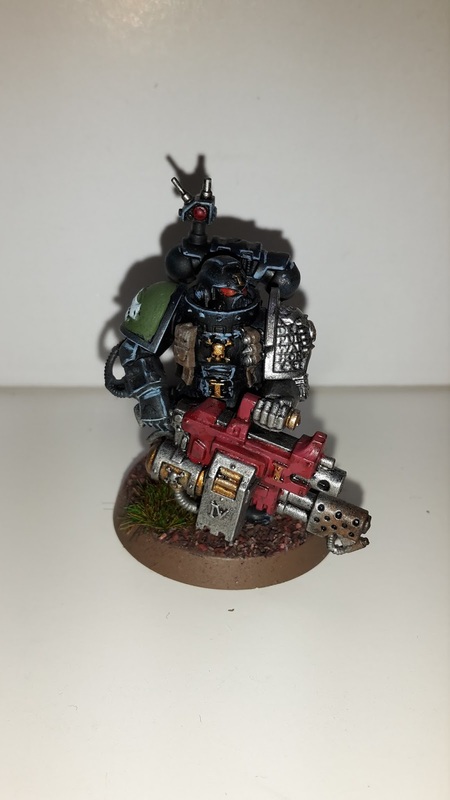 For me, the Deathwatch seemed like a new type of playstyle; a smaller elite force, with some potent firepower, but most likely to be outnumbered by the enemy army and requiring surgical precision to use correctly. I was keen to see how a Marine army would play that was not overly reliant on Grav weaponry and durable bikes, or fantastic re-rollable cover saves in order to win games. 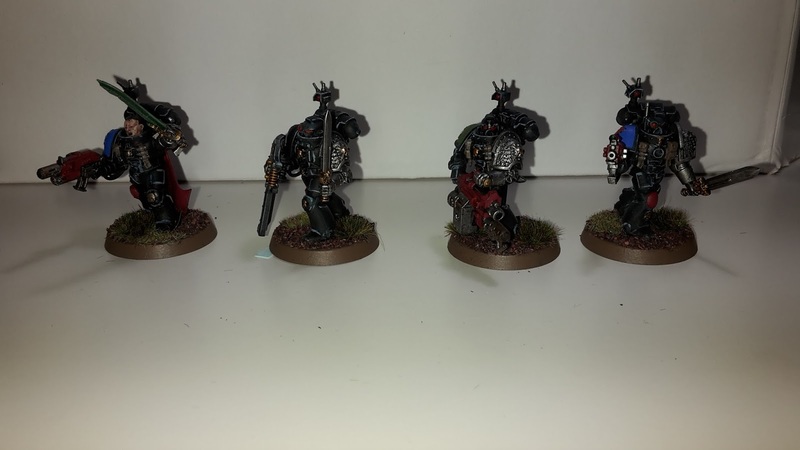 This week, I have been continuing my work on my Deathwatch Veteran Marines. 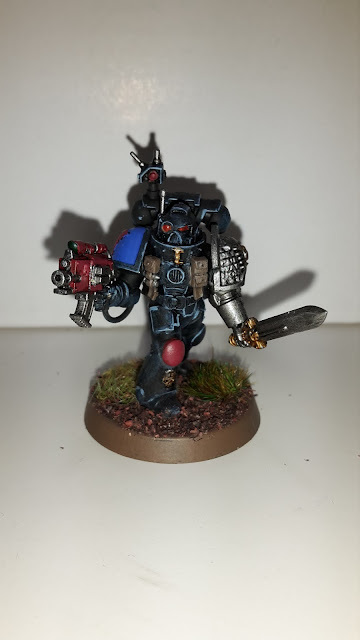 As I mentioned in last week's Hobby Sunday, I have been taking more time over the individual Marines in my Deathwatch army to help with the more small-scale, elite nature of the army. I have kept taking more time over the unit, but have started painting them in batches of 4 or 5. This gives me a chance to get a decent amount done and not have to wait too long for the paint to dry between the models..I have actually managed to get a fair amount done over the last week and have just over two squads or Marines painted at the moment. Before we get into the photos of the units, I was wanting to ask for advice on brush maintenance. Generally, I just wash my brushes with water and allow them to air dry. As a result, I get a lot of splitting of the ends which makes it very difficult for detailed painting in the squads. What do other painters do to maintain the quality of their brushes? Comment below with any advice you may have for me. 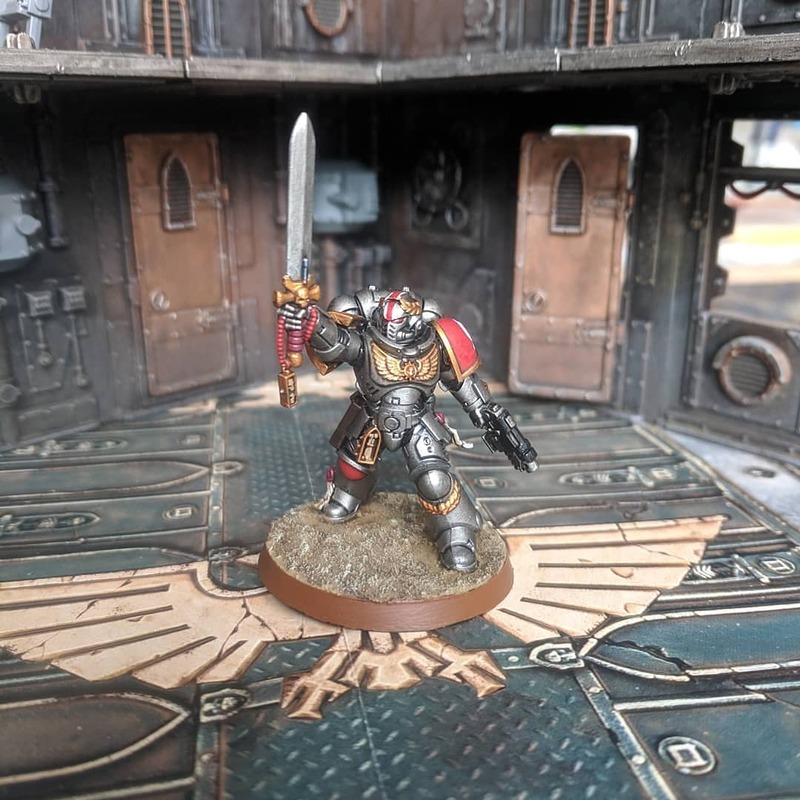 This week's battle report sees my Deathwatch take on Gareth's 30k Iron Warriors in the Cloak and Dagger maelstrom mission. I decided to mix up my army from its first iteration to change up the army. Only on writing this and double checking the codex, I realised that the army was not legal. Apologies to Gareth for the incorrect list. 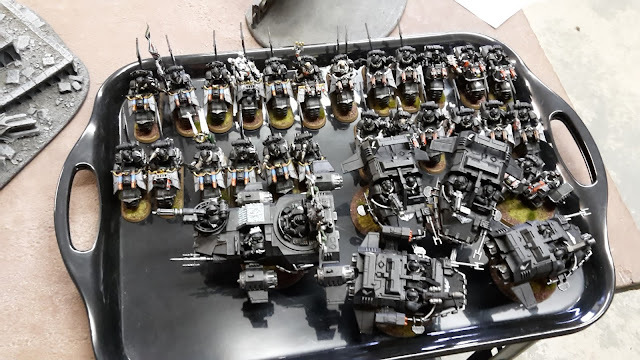 I had planned to put the whole army in the Black Spear Strike Force, thinking all the codex options could be taken as individual units, but this was not the case. Instead, I took an unbound section with the Bikers and Vanguard Veterans, neither of which used the benefits of the Black Spear anyway, but most people don't like playing against unbound without knowing. My Warlord Trait was Master of the Void Hunt, giving my warlord (Watch Master) a special shooting attack each turn, which of course, I completely forgot about during the game. The Librarian rolled on Biomancy, getting Smite, Enfeeble and Warp Speed. For the army, I decided to test out the Black Spear Strike Force. Given the mobility issues I had in my last games, I decided that deep striking with some of the army would be useful to counter this. I took the Watch Master and an Aquila Kill Team, as well as the Corvus Blackstar. I also took a CAD, led by a Librarian. I was keen to see if the Biomancy powers could boost the survivability of my units. I didn't get Endurance, but Enfeeble could be useful and swing some combats for me. I took a unit of Veterans with 4 Frag Cannons and two storm shields in a drop pod. This would allow me to deploy at least one unit on my first turn. I also took a Locator Beacon to help with my deep striking. I planned to combat squad the 10 Veterans and put two Frag Cannons in each. This would hopefully allow me to keep some of the Frag Cannons alive, my opponent having to take out two units instead of one. I took another combat unit of Veterans that would join the Watch Master once more. 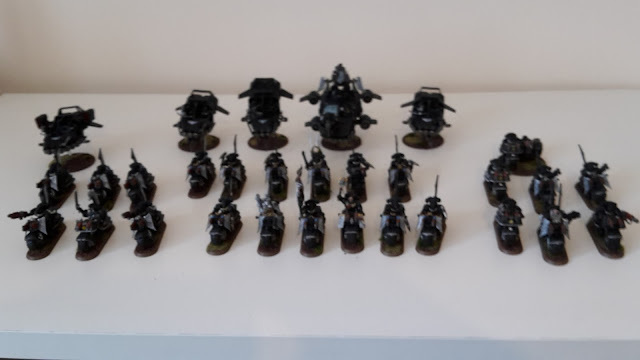 I also took two units of Bikers and a combat unit of Vanguard Veterans. This force would allow me to Deep Strike several units, as well as changing my Mission Tactics twice. As part of my continuing efforts to try all the gaming clubs in the local area, last week I visited Newcastle Warlords. The club meets at St Marys the Virgin Church in Fawdon on a Thursday (7-10 pm) every two or three weeks (depends on when the hall is available). I actually found out about the club when the organiser, Steve, messaged me after seeing one of my blog posts on another clubs' facebook page, so I was keen to go along and try it out. First off, the church hall was only a 15 minute drive from my flat, so perfect travelling time for me. The 7 pm start also allows me to miss the rush hour traffic, so another bonus there. There were about a dozen or so gamers there that night, playing a variety of games including 40k, Age of Sigmar, Blood Bowl, Guild Ball and X-wing. As the club is just starting out, they are a little short on terrain and ask members to bring along their own stuff. They do have several gaming mats though for players to use though. This wasn't such a big deal for me, as I had some of my own terrain with me in Newcastle anyway. It's quite nice to get to use my own terrain every once in a while after going to the effort of building and painting it! It also gives me a nice incentive to get more terrain built and painted. The cost was £4, which is a bit more expensive than the other clubs in the area, but still very reasonable for a club night. In addition, there is unlimited free tea, coffee and squash available. I had arranged a game on the facebook page and found myself taking on Stu and his Space Wolves with my White Scars. 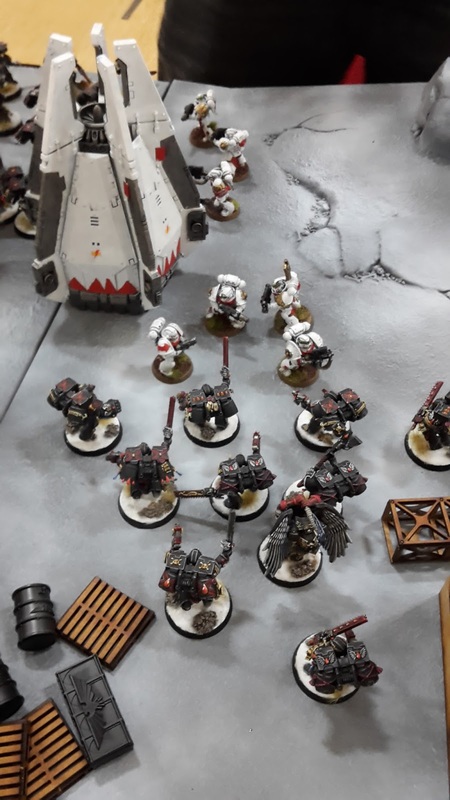 Stu has only recently got into 40k, so I went for a milder White Scars list to have a more fun and competitive game. We played the Contact Lost maelstrom mission, as Stu had not played a maelstrom mission before. I didn't take full notes for a battle report. Since Stu had not been playing long, I wanted to have a chat with him during the turns and hopefully help with any rules issues during the game rather than spending my time taking notes. 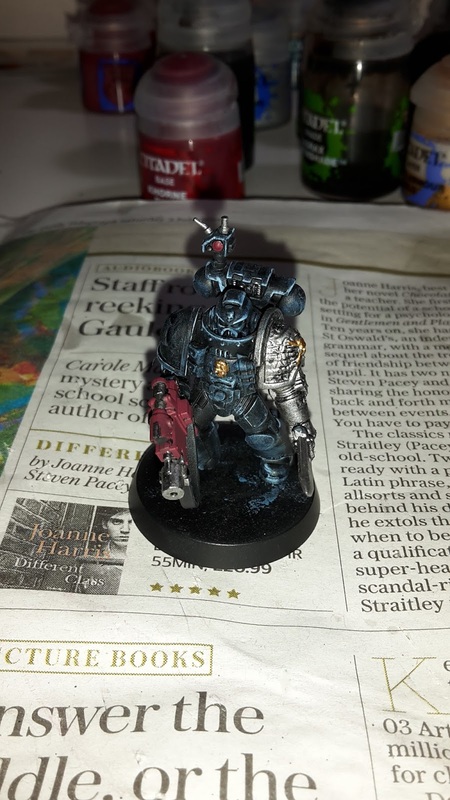 This week, I have been painting up the first of my Deathwatch marines to test out the colour scheme for the army. 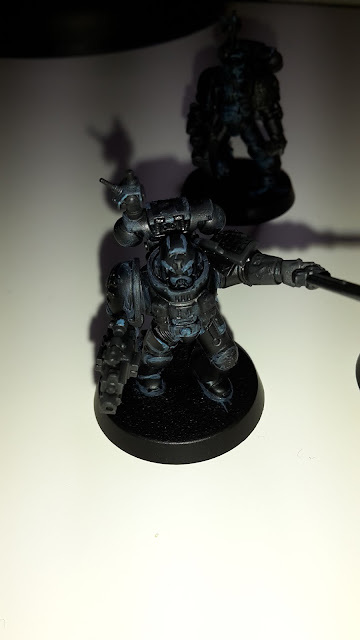 Earlier in the week, I had a go at edge highlighting the first of the marines. The attempt went ok, but I was advised to complete the rest of the Marine to see how the final product would look. I was able to finish off one of the Marines this week. I was pretty pleased with how the final result turned out. 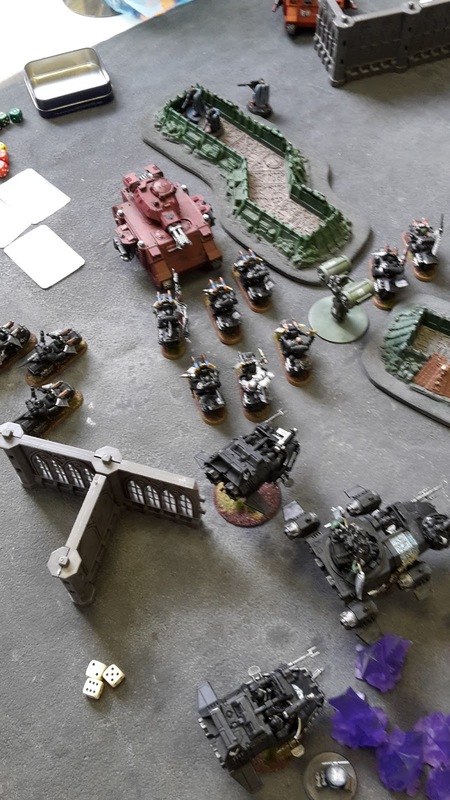 This week's second battle report sees my newly started Deathwatch army take on a mixed force of Iron Hands and Adeptus Custodes, commanded by William, in the Contact Lost maelstrom mission (3 cards each turn). For my warlord trait, I got Lord of Hidden Knowledge, giving my warlord and his unit five re-rolls. I started the army with the Watch Master. He is essentially a Chapter Master with an AP2 power weapon that strikes at initiative, pretty handy! I gave him the Beacon Angelis to allow me to quickly re-deploy a unit. I took a combat tooled-up Veteran squad to accompany him; a Blackshield with a power sword, two Heavy Thunder Hammers, a power weapon and a couple of Storm Shields for defence. I planned to put them in the Corvus Blackstar for assault. I then took a Veteran squad with 4 Frag Cannons. Deployed in the drop pod, these should eliminate any threat on the turn they arrive. I could use the Beacon to re-deploy them quickly to support the Watch Master. I also took a unit with Stalker Boltguns for some long range firepower. A final unit with an assault Heavy Bolter and a Sergeant with a Xenophase Blade was also added. I took a Bike unit with power weapons, this would give them some good mobility and combat ability. With the points left over, I took two individual Vanguard Veterans with Heavy Thunder Hammers. This would give them good mobility and could hit really hard in combat. 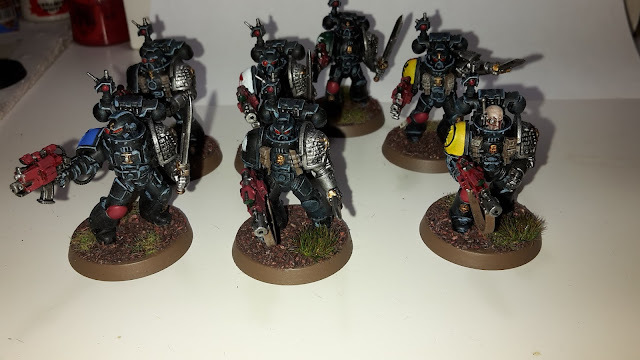 I started painting up my Deathwatch marines this week, wanting to try some new techniques on them for once. After undercoating them black, I had a go at painting the first edge highlights with Thunderhawk Blue. As you can see in the photos below, I am not used to this technique and my first attempts were pretty heavy handed. This week's battle report is the first game featuring my new Deathwatch army. I was playing at Heaton Games Club taking on Adam and his Tyranids. I had previously played his Dark Eldar, so was interested to see how this game would play out. We rolled for mission and got the Relic. For my warlord trait, I got Lord of Hidden Knowledge, giving my warlord and his unit one re-roll. This post will review my army for the recent Fluffageddon tournament, how it performed and how it could be improved. In order to put the reviews in context, my battle reports for game 1, game 2 and game 3 can be found in the tournament tab. Today's post features some of the army photos from the Fluffageddon tournament. Hope you enjoy! First up is Ian's Ork army. He actually ended up taking the Best Army award and it was well deserved. You can see more of his army on his blog, Need More Tanks. 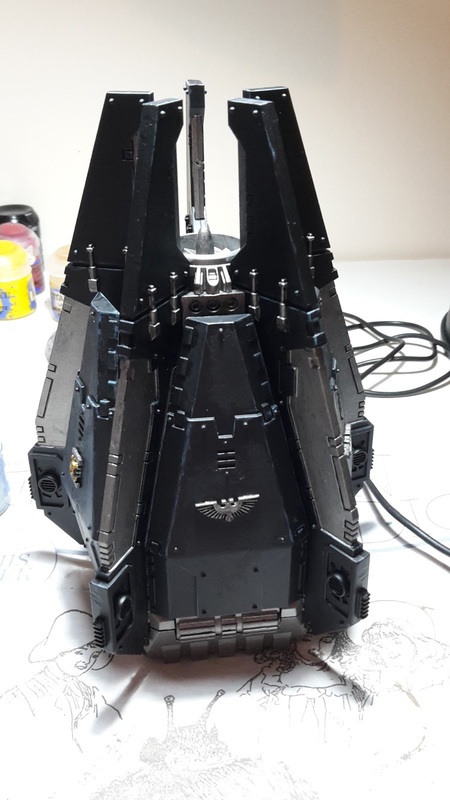 Next is my own Ravenwing. The final game of Fluffageddon 2016 saw me playing at the top table against Danny and his Eldar army. This mission would be a variation of kill points, where the units destroyed would be worth Blood Points equal to their points value (with half points available for a unit taken below half strength/starting wounds/starting hull points). My warlord trait was Rapid Manoeuvre, giving me +3" to charge and turbo-boost moves. 40k Rulebook FAQ now up! wanted to share this link with the blog readers. The rulebook FAQ is now up on the warhammer community page. - Scout moves occur before Seize the initiative. This makes sense, but it was nice to have an extra tool for countering seizing. - Passengers in a jinking vehicle don't have to fire snap shots. 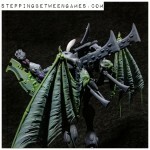 I would have liked to have them fire snap shots as per the draft FAQ, but Dark Eldar players will be happy (for once!). Any other changes that I may have missed? After a great first round game, I found myself at the top table facing off against Lewis and his tank-heavy Astra Militarum army. This mission was the Eternal War mission Crusade with 5 objectives. My warlord trait gave the Chaplain Courage of the Lion, giving him a 12" Fearless bubble. I've steadily been continuing to write content for Frontline Gaming, as well as my own blog posts here. I thought I would take the time to highlight some of my recent articles that may be of interest to the blog readers that you may have missed. This was an editorial based on a recurring trend when I go to tournaments these days. It was sparked after attending the recent Fluffageddon tournament, where not a single one of my three opponents had a paper copy of their army list for me. Instead, I was given a phone with a Battlescribe file to take a quick look before the game started. These are some of my thoughts on the etiquette of tournament lists. In addition to these, I have a whole host of Space Marine and Dark Angels unit and formation reviews on the site for your perusal. Hope you enjoy! Welcome to the first battle report from my games at Fluffageddon 2016. The tournament was billed as a more relaxed event with a moderate degree of comp and emphasis on building an army that fit with the background of the relevant race. Overall, the tournament was good fun. I got some really nice compliments on my army, which was great considering some of the standard of painting there. There were a few issues though that I will get to in a later post, but it was generally a fun day. My first game saw my Ravenwing army take on Tom and his Blood Angels in the Contact Lost Maelstrom mission (3 cards per turn). My warlord trait gave the Chaplain and his unit furious charge. You can find some of the army restrictions and my thoughts on my list in my previous post. Hi everyone, this week's Guest Post comes from Chris Rhode. 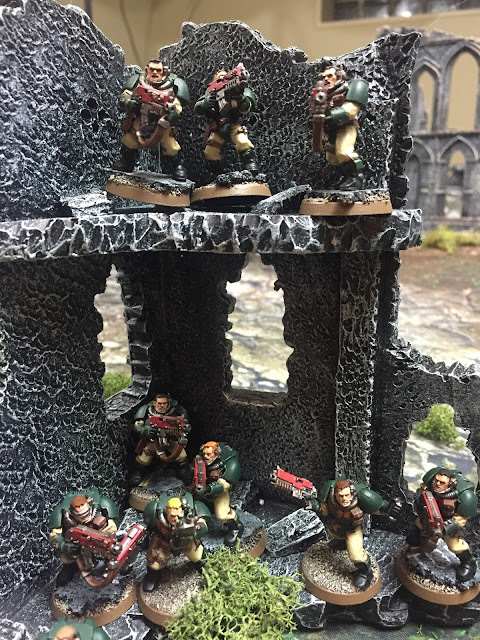 In this article he talks about his top picks for Youtube channels for 40k video battle reports. Hi again St. Andrews faithful! Thanks to your gracious approval of my last guest article I got to write another, and I sincerely hope that this one will be at least as useful and/or interesting to you. So let's get right to it - I love batreps, you love batreps, and all of us especially love GOOD batreps, otherwise we wouldn't be on this blog right? And without leaning myself too far out of the window I daresay most of us also enjoy a good video battle report. And by now there's also quite a few channels on youtube, so at times it can actually be hard to find the really good ones. By “good” I’m talking about things like decent lighting, non-garbled sound, and maybe even an engaging host and painted armies. As you can imagine, the creation of such high quality video batreps takes time, maybe even more so than written ones, so usually there’ll only be no more than one or 2 new releases every week. 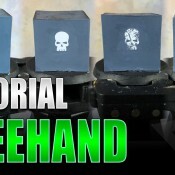 So, to fuel my batrep addiction, whenever I came across a new good channel I made sure to subscribe. And now I get the chance to promote my favorite channels here and you get to see some cool batreps - win-win situation I'd say! First off I'd like to group my list of channels into 2 categories - ‘short form’ batreps and ‘long-ish’ batreps. Now if you're anything like me you don't have unlimited hobby time, or at least not as much as you’d like. There's usually a job involved (to pay for new plastic crack), shopping for groceries and preparing meals (so you don't, well, die), daily hygiene (so other people will want to play with you) and maybe even a significant other (that has be placated every now and then unless you want to risk him or her pouring paint and super glue all over your Dark Eldar army. Yes, yes that actually happened and I know I mentioned it in my last article but even 10 years after there’s still some hurt feeling here. I mean, superglue, really?!). So anyway, hobby time comes at a premium and at least for me that means I cannot watch a 2 hr battle report where you show me every single dice roll, and frankly, I wouldn’t even want to. Thankfully a lot of channels do some post-production now, and cut their videos down to a much more manageable 30 - 90 mins. My absolute favorite in this segment is hands down Winters' channel - Winters SEO. Even though I have no idea what "SEO" stands for (senior executive officer? ), I DO know that I love his channel to bits and his batreps (and other videos) are simply superb. Featuring very nicely painted armies, great scenery and my personal favorites in the realm of battle mats (gamemat.eu), it's hard to find something that could be done better. But the unique trait that makes this particular channel my favorite is Winters himself. The way the man tells the story of the battle, his tone of voice and the way he talks really draw you in. In fact I believe he'd make an excellent audio book narrator if he ever finds himself not liking his current job anymore. This week for my hobby progress, I finished re-basing my Ravenwing army and assembled some more of my Deathwatch marines. Most of my Ravenwing army has now had their bases updated to match my White Scars. This army was the one that I took to Fluffageddon yesterday (this post was written in advance, so I have no idea how I did at the time of writing). Tonight I will be travelling down to Sheffield to take part in the inaugural Fluffageddon event on Saturday. 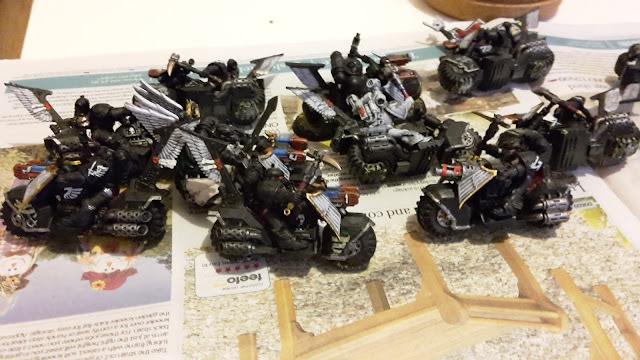 My Ravenwing hope to perform well on the battlefield tomorrow and have three fun and entertaining games. If you are a reader of the blog and are attending, be sure to come up and say hello, especially if I have not met you before! I intend to capture all my battles for future battle reports, so look forward to seeing how I get on. 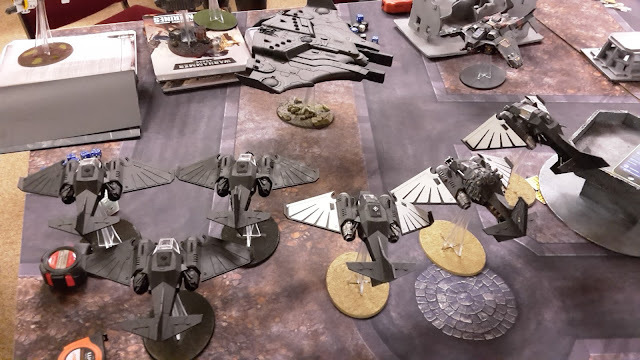 This week's battle report sees my Ravenwing take on Chris' Astra Militarum force. This was another practice game for Fluffageddon that I managed to fit in the same gaming night as the previous battle report for my first visit to Heaton Games Society. As we were getting a little short on time, we decided to play an Eternal War rather than maelstrom mission. We played Crusade with 4 objectives. Once again for my Warlord Trait I managed to get Rapid Manoeuvre, giving me an extra 3" on my charge. This week's Guest Post is another from Darren Tse (he is on a roll at the moment!). Having recently just got back into 40k, Darren has written about his experiences of getting back into the hobbying aspect of 40k this week, detailing some of the challenges that he has faced. Be sure to check out the Youtube channel he helps contribute to, 1Plus Productions. Hi guys. I recently started playing 40k, and at first was quite reluctant to start the hobby side. I have played before, but way back in the early 90's, and let me tell you, hobbying back then was not fun. Models were poor, lacked detail, and were mostly lead or pewter. Nothing seemed to stick lead to lead very well. Things were not as snap and fit as they are today, and it was both impossible and potentially toxic to try and cut and shave your lead models. 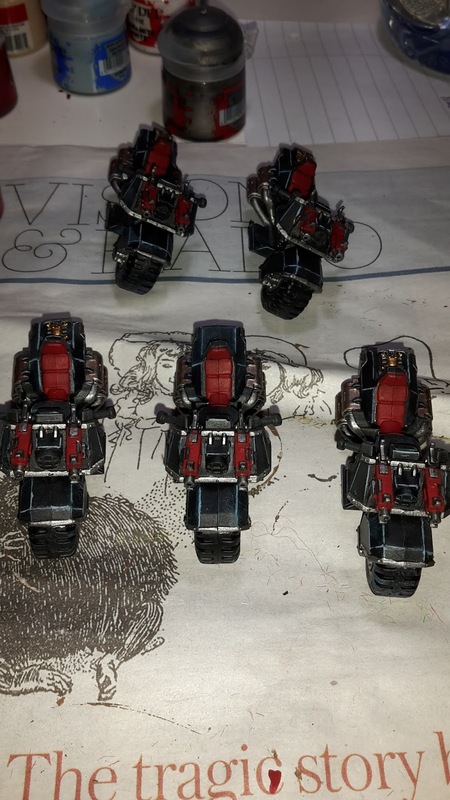 Primers sucked, did not stick, and generally removed any of the already lacking detail on the models. Paints were poor, and to wash, you actually had to mix up black with water to the perfect consistency. All in all, being a hobbyist back then took true dedication. But apparently, so I’ve been told, that has all changed! Even fine-cast models are better, and the plastic is really a dream. Super detailed, snap and fit, and good plastic glue make modeling, kitbashing and converting a breeze. Very good paints, from multiple manufacturers, give the painter a plethora of choices. And allegedly, nuln oil is like liquid skill. So it was with great excitement that I decided to start hobbying again. Up until this point, I had had a lot of my models commissioned. I wanted my things to look good on the tabletop, and did not feel I had the skill to do that. But having been encouraged by my fellow players, I’ve taken the plunge and started to hobby. Over on our YouTube channel, you’ll see the video series called Work In Progress, which chronicles my somewhat amateurish forays into the hobbying world. These blog posts will accompany those video episodes, so please enjoy. I decided right off the bat, with my limited hobby time and short attention span, that I would need some short projects and some longer term projects, and that I would need multiple projects to jump back and forth. I know myself, if I have just one project that has seemingly no end, I will end up quitting. So to keep the motivation high, I gotta keep it interesting. If you are like me, then I do recommend having several things on the go. However, if you are the type that can sit down and concentrate and finish one thing off at a time, then power to you! I recently moved, and my nice big basement has been turned into my 40k area. 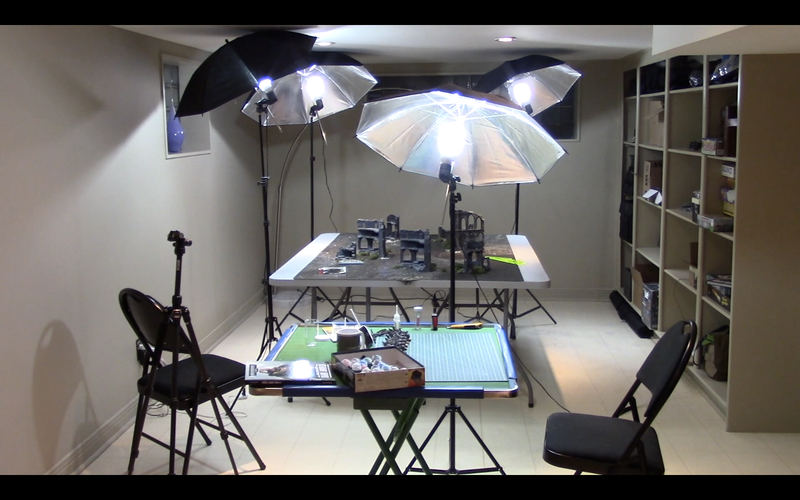 I got a big gaming table with plenty of shelving to store things, and bought up some studio lights for our video batreps. I used an old Mahjong table for my hobbying. 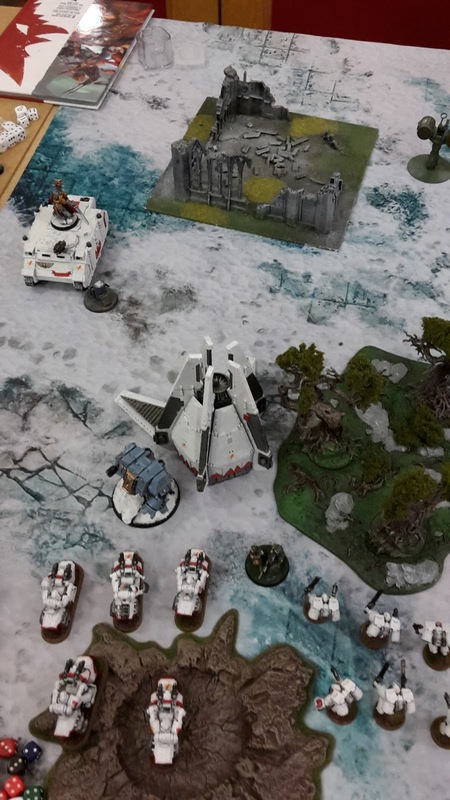 This week's battle report comes from a recent visit to Heaton Games Club. I was wanting to get some practice in with my list for Fluffageddon, as I had not played my Ravenwing in some time. I would be going up against Adam and his Dark Eldar list in the Contact Lost maelstrom mission (the one where you get a card for each objective you hold). For my warlord trait, I got Rapid Manoeuvre, giving me +3" to any charges. This would be great for my Command Squad, helping to ensure they get into combat. In order to use the rules for Fluffageddon, I would be limited to a 4+ for any re-roll save on the re-roll. My continuing search for local games clubs in Newcastle, brought me to Heaton Games Society last week. The club meets in Heaton on a Sunday from 4.30-9.30 pm. It was only a short 15 min drive from my flat, which was great and very local. I actually ended up attending the club on the same day that I had tried the Northumbrian Adventurers Guild on the Sunday. Straight off, the club members were very friendly. I wandered into the Community centre bar (another big plus there!) and one of the club members spotted my carry case and directed me to where the club meets. As soon as I entered, I was greeted by one of the club members, who introduced me to a bunch of the other players and helped me to get a game organised. I was actually able to grab two brilliant games of 40k, both of which will be written up as battle reports in the coming weeks. When I first arrived, there were a couple of players setting up for a game of Space Marines vs Genestealers Cult. 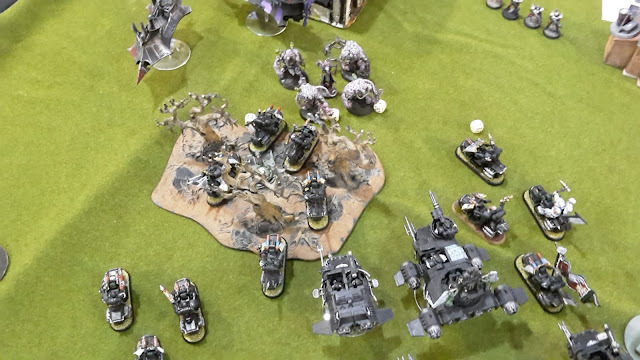 The Cult player had managed to roll a 6 on the ambush table (allowing him to charge from deployment 3" away) for his Patriarch and Purestrain Genestealers. The Space Marine player was not too worried as he had the first turn. "If you seize, I am going to rage quit this game" he joked. I think we all know what happened next! I don't know how the game ended, but I imagine it was quite a contest. This week, I have another Guest Post from Darren Tse. 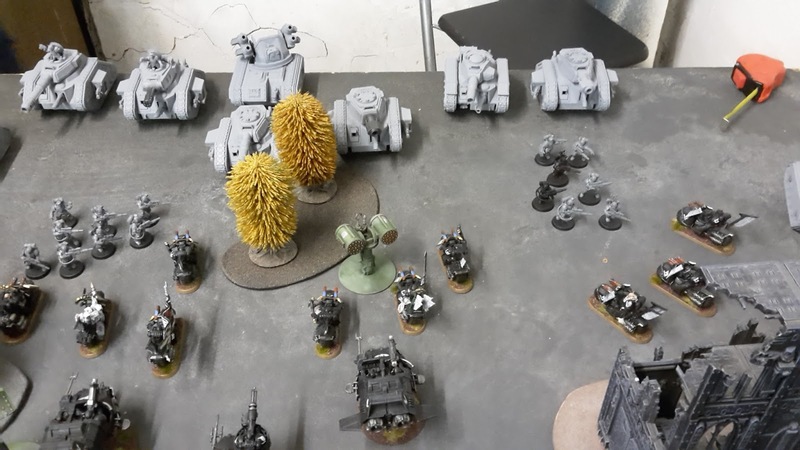 Last week, Darren posted a report on his experiences of his first ITC tournament after just getting back into the game. He managed two wins and two loses at the event. This is even more impressive when you consider he had only played three games of 40k before that point. 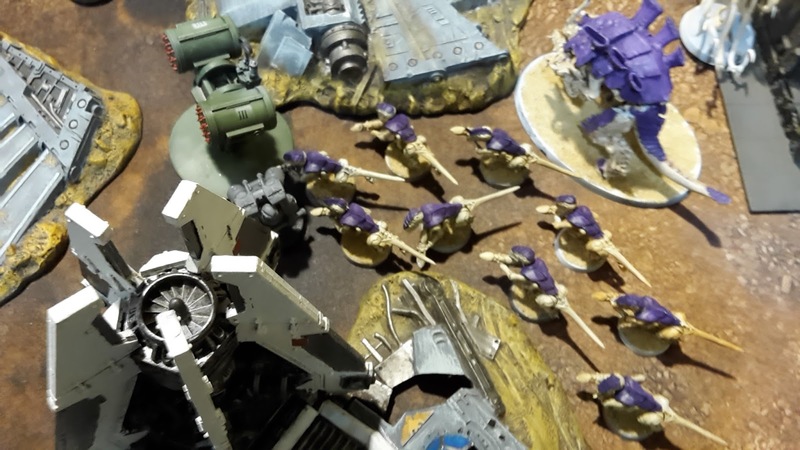 In his latest guest post, Darren talks about how he went about preparing as a first time tournament attendee and as a new 40k player. So you’re ready for your first tournament. Your first foray into competitive 40k. It’s an exciting time! I know the feeling. 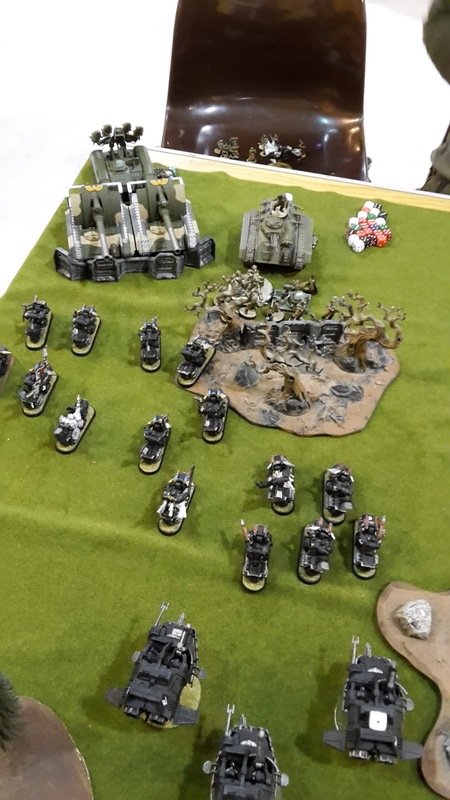 I recently attended my first ever 40k tournament, and boy, was it fun. But it could have very easily been one of the worst hobby days of all time. It’s not a given that you just turn up at your first tournament and have a blast. There are factors out of your control (like other players, the venue, etc. ), but there are a lot of things YOU can do for yourself, to prepare for the day. And although these things may well help you perform better in terms of results, these tips that I present to you are mostly to increase your own enjoyment of the tournament as an overall experience. This week, I have been working on my bikers for my various armies. 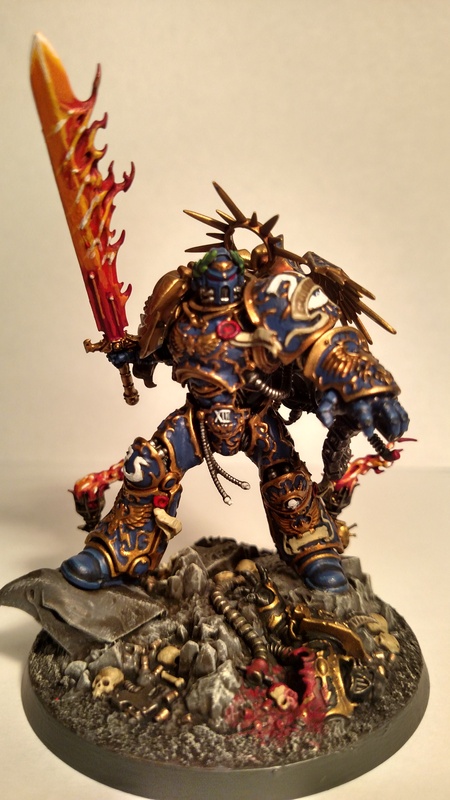 I decided that I would re-base my Ravenwing for the upcoming Fluffageddon tournament. The reason for this is that my Interrogator-Chaplain was based in the same fashion as my White Scars as he is a part-timer who works for both armies. 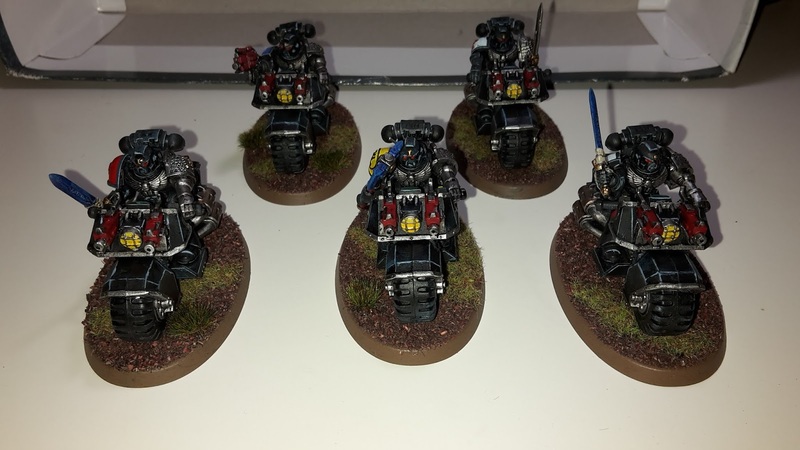 Rather than rebase him to match the Ravenwing once more, I decided I would do up the bases on my Ravenwing bikers, as they were a bit plain and could use some work. First I removed all the bikers from their bases and then scraped off the flock that was there. 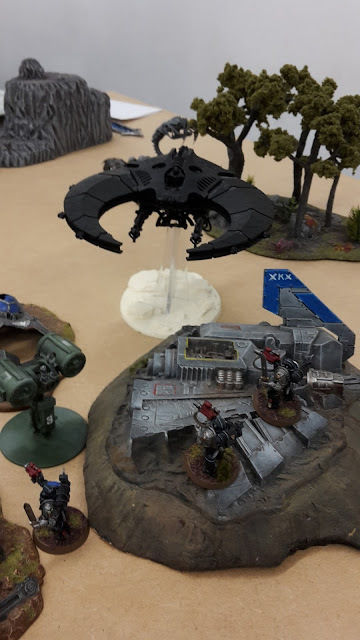 This week's battle report features a whole host of fabulous flyers! With my recent move down to Newcastle, I was saddened to leave the great guys and girls at Dundee Wargames Club. 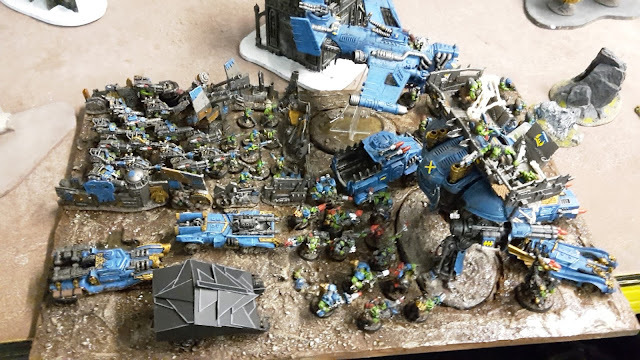 As a sort of leaving-do/game, I decided to host a massive 40k flyer battle based on the scenario in Death from the Skies. I had done the same game a few weeks earlier with two of the players from the club to test the rules. It was an absolute blast and we decided to add some additional special rules as the game went on to make it even more fun. Flyers are not allowed to leave the board. There can be nowhere to hide in this game and I wanted a ton of flyers on the board at once. At the end of their move, flyers are allowed to make an additional 90 degrees turn. If they choose to do so, roll a D6. On a 1-2, the G forces rip the aircraft apart and it is destroyed. Flyers with Vector Dancer can turn without penalty as normal. Flyers that Jink suffer -1BS the following turn for each enemy flyer they jinked for. E.g. if you are fired upon by two enemy flyers and jinked twice, you suffer -2BS the next turn. This was to stop one side from being too powerful and forcing multiple flyers to jink and snap fire next turn while doing little damage. Any time a flyer is destroyed, it careens out of control. Roll 2D6 and a scatter dice, the aircraft moves in this direction, stopping if it hits another flyer. If it collides with another flyer(s), both players roll a D6. If the player with the destroyed aircraft beats the roll of the player with the flyer it hit, both flyers are now destroyed! "Janked" is the official past tense of "jink" for this game, i.e. "I'm at -1BS as I janked last turn". When a flyer is destroyed, it get to come back on in the players next turn. Players would score 1 point for each destroyed enemy flyer (2 points for the massive Tigershark). If a destroyed flyer crashed into any other and destroyed them, the points would go to the player who shot down the original plane. We decided that the four teams would roll off for priority each turn, the highest roll going first, the second highest going second, etc. This would create even more chaos as players could potentially get two turns in a row. The game was fought on a 8x6 feet board. Based on the additional special rules in effect, I expected lots of carnage on all sides! As part of my search for a new gaming club in Newcastle, this past weekend I attended Northumbrian Adventurers Guild in Blyth. The club runs from 12-6 pm every Sunday, with Blyth being a decent 30 minute drive from my flat in Newcastle. I set off from Newcastle in the pouring rain to reach Blyth for 12 pm. When I got to where the sat nav had directed me, I found myself in the middle of a residential area with no church in sight. I wandered around for a bit, then got directions to the church hall. I arrived around 12.30 an eventually found my way up to the club. The Church hall was nice, light and spacious and there appeared to be a huge storage area packed with terrain, this looked promising. There were 4 people inside, three setting up for 40k and one setting up for what I later found out to be Frostgrave. I smiled at some of the other gamers and sat down on one of the seats. After about 10 minutes, no one had approached me or even spoken to me. I eventually went up to the 40k crowd and introduced myself, asking if there were any committee members that I could speak with. The guys were very nice and welcoming, but told me the members don't really show up until about 2-3 pm. They said if I hung around, I would be able to get a game of 40k. The latest guest post comes courtesy of Darren Tse. Darren is a recent returner to 40k after a long break. 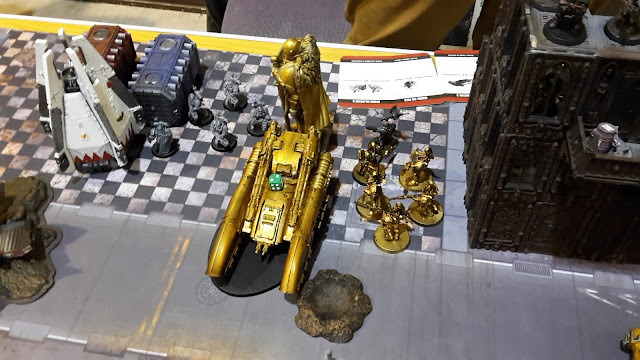 He decided to attend a ITC tournament with only a couple of games played and decided to write up his experiences from his games. Over to Darren for his thoughts on his games. So I’m pretty new to 40k. I actually started playing in the early 90s as a broke teenager, but stopped shortly after that. Picking it back up now has been awesome, and with just a few games under my belt, I decided to try my hand at some competitive play. Our local scene runs a bi-monthly ITC-based tournament called Powerfist & Psykers. It’s 1850 pts, 4 rounds, straight ITC. This was Powerfist & Psykers 5. There were 16 players, so I was really looking forward to a day of good gaming and learning lots about how to play my army and 40k better. Our local meta, from what I can see, is a lot of Tau-Dar (Eldar with Riptide Wing mostly), and Imperial Knights, as well as Chaos Demons. We have very little in the way of other xenos races, and also a lack the usual battle company heaviness. Using the models I have, I decided to go with my favourite army, my Ravenwing! 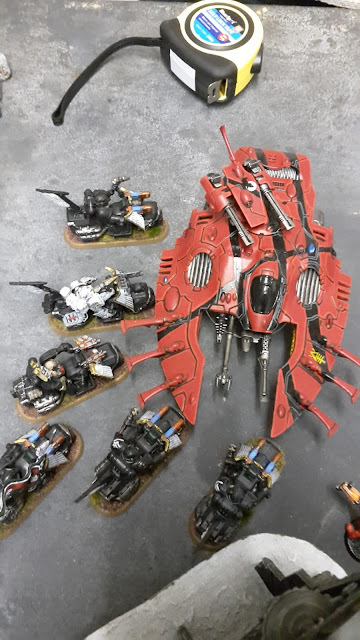 I had at first thought of bringing pure Ravenwing (which is mostly black knights with speeders and darkshrouds), but decided that against such a meta, I did not want to get tabled for 4 games, so decided to add a little bit of “cheesiness” to my list and bring my own riptide wing. I also knew that winning in ITC requires holding objectives, so I needed some objective secured. In the end, I decided to run a double Dark Angels CAD and a Riptide Wing. 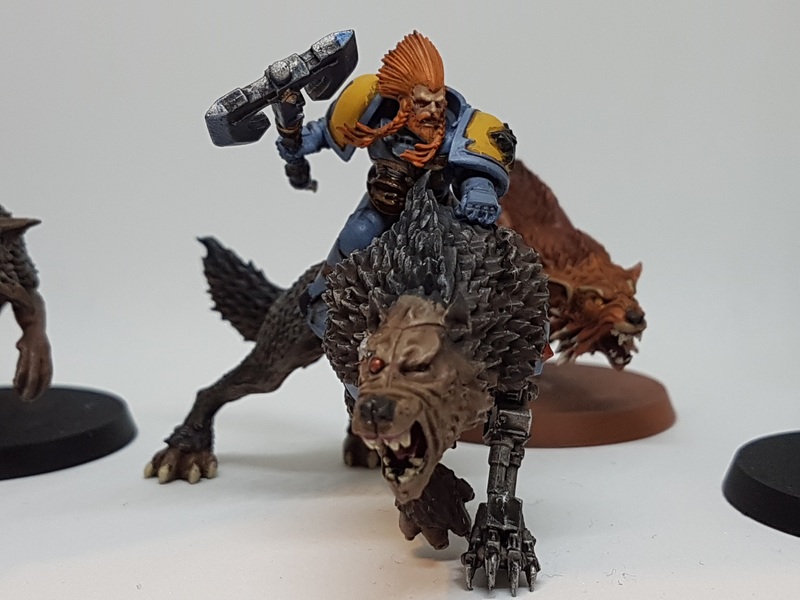 This is my first Hobby Sunday post in around 7 weeks as I have been busy with moving house, writing codex reviews and waiting on new models to arrive. Well, last week my Deathwatch delivery finally arrived and I was able to spend some of this weekend getting a start on some of the models. This weekend, I decided to build the Veteran marines squads. After poring over the codex, I decided to build four different squads with the boxed sets. With no Blog Wars this November, there is another event being run to take its place; Fluffageddon. This tournament is designed to create an event that brings more variety to armies and "encourage" players not to bring filthy lists for the game. This was in a similar vein to Blog Wars, so I will be attending Fluffageddon too. I was originally going to take my White Scars as that army has the most variety in it. However, I have been playing them a lot recently, especially in tournaments, so thought I would give them a break. Instead, I have decided that my Ravenwing will be getting an outing for the tournament. This will allow me to create a nice, fluffy list that will also be very strong, as the Ravenwing are great at the moment. I thought about my Guard or Orks, but I honestly don't know if I could field an army within the tournament restrictions, and anyway, I don't have them with me in Newcastle yet. My search for a new gaming club kicked off with a visit to Durham Raiders a couple of weeks ago. They run a regular games night on a Tuesday at 6 pm. Unfortunately, I don't finish till 5.30 pm, so by the time I finish work and make my way through the rush hour traffic to Durham, it would hardly be worth setting up for a game! What is more fortunate for me, is that they also run a club night on a Sunday every two weeks. I quite like a weekend club. They normally start and finish earlier than a weeknight one, so I can be back home before 11 pm. The downside of a weekend club is that many of my weekends tend to get busy quickly, so I can't always make them. I wandered down to Durham Raiders for a game against Paul and his Space Wolves. 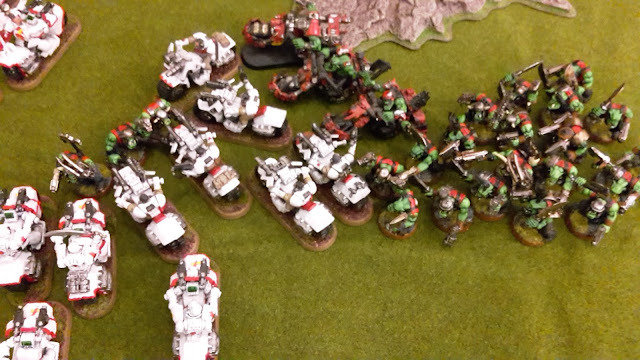 I was playing my White Scars once more as this was the only army that had made the move from St Andrews so far. As I have been playing them a lot recently, I decided to try a different type of army than I was used to. I decided to give the Gladius Strike Force a go as I had never fielded the Strike Force or indeed a Battle Demi-Company. 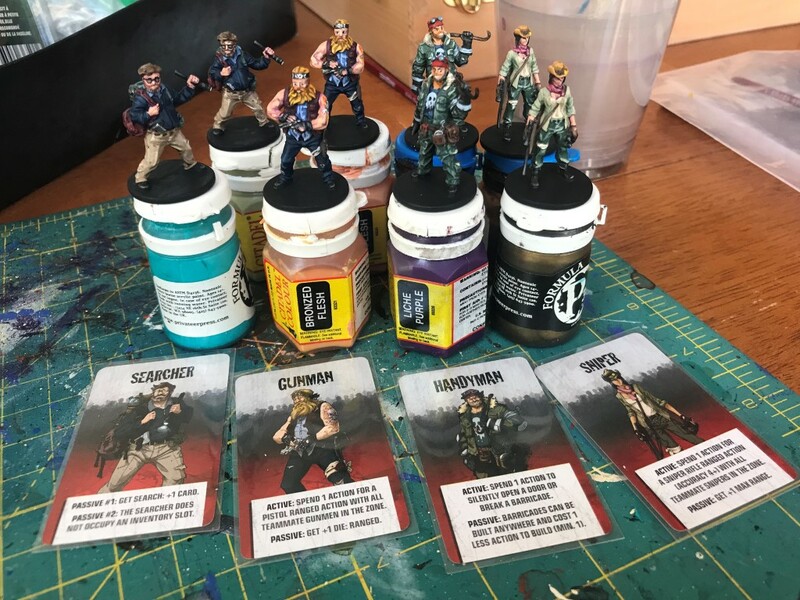 This week's Better Know A Blogger features Ian (AKA Ginge) from Need More Tanks. Ginge contacted me a few months ago when the series was taking off. He was keen to take part, but wanted some time to get his blog dusted off and get some more regular content posted. The return of the series last week must have prompted him to get back in touch! Need More Tanks is a veteran blog, starting back in 2009. His blog features a good mix of content to keep most gamers happy. There is regular hobby updates showing the work in progress on his various armies and battle reports, as well as board game reviews. His recent article on his hobby to do list shows he will have lots to show in the future. Having a Deathskulls army myself, it is no surprise that I am particularly fond of Ginge's Deathskull Ork army. Not only is it a great looking force, but it features some fantastic looted vehicles showcasing his awesome conversions. One standout is the looted Imperial Knight, something for all thieving Ork gits to aspire to! I recently attended a 24 hour gaming charity event, run by Nick from The Burning Eye, called Hero for a Day. The event was due to feature 8 games of 40k over a 24 hour period. The event was a lot of fun and raised a lot of money for a great cause. After seven games of 40k, the Defender's team (the team I was on) was so far ahead that the final game would have no influence on the result. Rather than play the same people again, we decided to do a free for all and I ended up playing against Rob (30Kplus40K) and his Blood Angels. Unfortunately, after being up for almost 45 hours at this point, I was starting to get a bit grumpy and tired. We set up and started the game, but only got to about turn 2 before I finally gave in. As a result, I never got the full battle report to write here, but I did take a bunch of photos of the game. I thought I would share the photos here for those that were interested. I'm hoping that with my recent move to Newcastle, I can arrange to meet up with Rob once more (possibly at Warhammer World) to get a proper game against him at some point. Till then, I hope you enjoy the photos.